With the temperatures warming up outside and the sun shining bright there are things that we cannot do without when we head to the park. As a Mom I'm not only looking out for my son, I'm also thinking about the whole family and/or friends we join at the park. Although my son has outgrown diapers by a few years, we always have baby wipes with us wherever we go. You just never know when you'll need to wipe off a dirty face or sticky hands! Currently we're toting around the new and ever so stylish >>Huggies Clutch 'n' Clean wipes<<. You'd never know you are carrying a clutch with baby wipes in it, would you? They have trendy designs to reflect your own style and complement your diaper bag, purse or even your outfit! The next thing we always have is sunscreen. I'm always on the lookout for the highest SPF as well as most natural ingredients. After that we make sure to bring a few snacks with to the park because all that running around wears a person down and when that happens, you'll want immediate energy or food. It seems that my child always will scrape a knee or get a sliver in his finger when we're away from home so a few band-aids and some neosporin are a nice addition. Lastly, we always make sure to have water! What does your summer pack look like when you're heading out to the park or on a picnic? I'd love to hear! 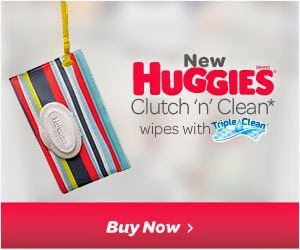 To check out the new Huggies Clutch 'n' Clean Wipes, or to get your own -- click on the image below! Wishing you a lovely rest of your weekend and for those papa's out there, happy father's day to you (tomorrow)! Again, many thanks to Huggies for sponsoring today's post, and inspiring me to stay stylish on the go! These are great things to have, even for adults! I would totally bring baby wipes with me to the park because there's always something gross that you put your hand on, or there's never toilet paper in the bathroom. Sunscreen and band aids are a must for me too! Baby wipes need a new title right? Like on the go cleansing cloths or something! ha! We use them all them time!